2. Hershey India plans to invest $50 million in India in the next 5 years. Increasing sales, more investment coming to India, but at what cost? Our children’s health. I remember this brand vividly because around 2 years back, my daughter used to ask me to buy Hershey’s Chocolate syrup for her, whenever she accompanied me to the supermarket. I had bought it twice but she didn’t like the taste of it when mixed with milk. The picture of the pack you see was bought in early 2016 and was lying in a corner in my pantry. Before I throw it out, I thought why not write about it first. As far as I could remember, this was the only product from Hershey’s lined up in the supermarket shelves in late 2015 or early 2016. Now there are so many other offerings from Hershey’s - milkshakes, milk booster, spreads and what not. First, let’s look at the ingredients of the Chocolate syrup. Sugar features right on top (even before water). Invert Sugar and Liquid Glucose are all variants of sugar as well. 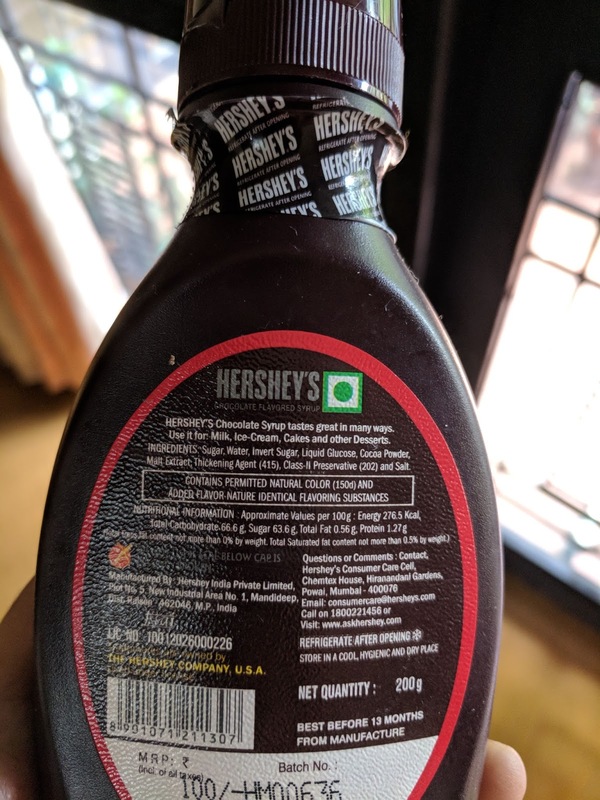 As per the nutrition information, 100 gms of Hershey’s Chocolate syrup contains 63.6 gm of sugar. 1 serving (approx 2 tbsp) equals 39 gms of chocolate syrup, which means 1 serving contains 6 tsp of sugar (25 gm). If your child likes chocolate flavoured milk, mix a tsp of unsweetened cocoa powder with 2 tsp of sugar in a glass of milk and serve. 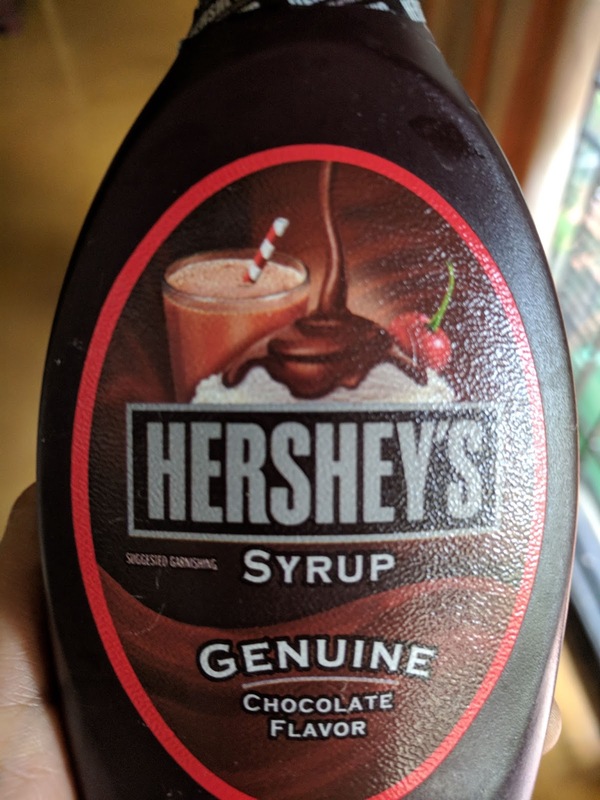 What is the need for such sugar-heavy syrups? Let’s not forget the Class II preservative - 202. Has the potential to damage our DNA and is toxic to our white blood cells. Sorbates have been associated with asthma, eczema, eye irritation, nasal irritation and behaviour problems among children. It also aggravates food intolerances. If you see a mention of Class II preservative, it is better to stay away from such products. I had earlier written about it in Kissan Tomato Ketchup article as well. 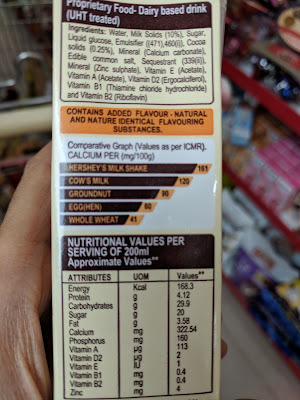 As you would have observed, the ingredients list is very similar to that of chocolate syrup, except for the fortification of calcium and Vitamin D.
Sugar features right on top here too. 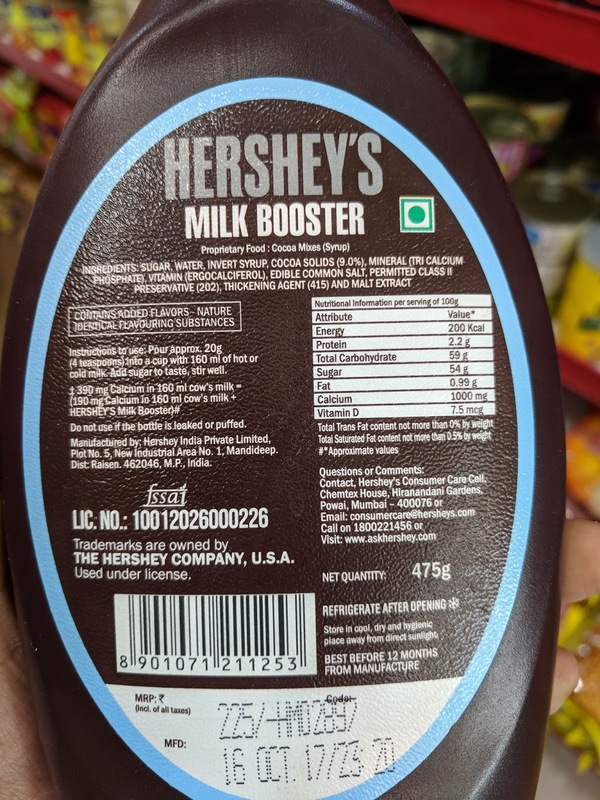 As per the nutrition information, 100 gms of Hershey’s Milk booster contains 54 gm of sugar. The recommended serving size is 20 gm, which means 1 serving contains 2.5 tsp of sugar (10.8 gm). Here’s the funny part - in the instructions to use, the pack states that “Pour approx 20 gm (4 tsp) into a cup with 160 ml of hot or cold milk. Add sugar to taste, stir well”. In the task of “forcing milk down the child’s throat”, how much sugar are we giving? The ad model Tara Sharma (yesteryear actress who is now in the business of promoting junk, just like her peers) is instructed to say that a glass of milk with milk booster gives twice the calcium as that of a glass of milk and is essential for growing kids. I wish there is a celebrity who would promote sesame seeds, ragi and curry leaves as high sources of calcium. Until then, let me keep reiterating. For those of you who haven’t read my earlier article on plant-based sources of calcium, please check it out here. Yet another packaged drink that is promoted big time in cartoon TV channels like Disney. The tagline states “30% more calcium and 5 essential vitamins for growing kids”. A serving of 200 ml tetra pack contains 20 gm or 5 tsp of sugar. Do we need to feed our children so much sugar in order to ensure they get their required calcium and vitamins? 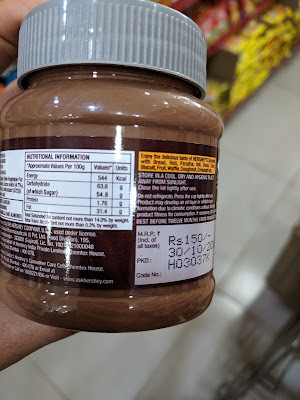 Given the increasing demand for Nutella among the urban elite Indians, here is a sugar-loaded spread from Hershey's. Ingredients - Sugar, Edible Vegetable Fat (Palm Oil), Milk Solids, Cocoa solids (4.7%), Almond paste (3%), Antioxidant (322(i)), Edible Common Salt. Sugar features right on top here too, along with fat from palm oil. 100 gms of Hershey’s Cocoa with almond spread contains 54.8 gm of sugar and 31.4 gm of fat. And also note the measly 3% of almond paste. Seriously? Have we all forgotten how to make chutneys? Do we need a sugar-heavy, fat-heavy artificial spread, when our cuisine has 100s of chutney varieties? 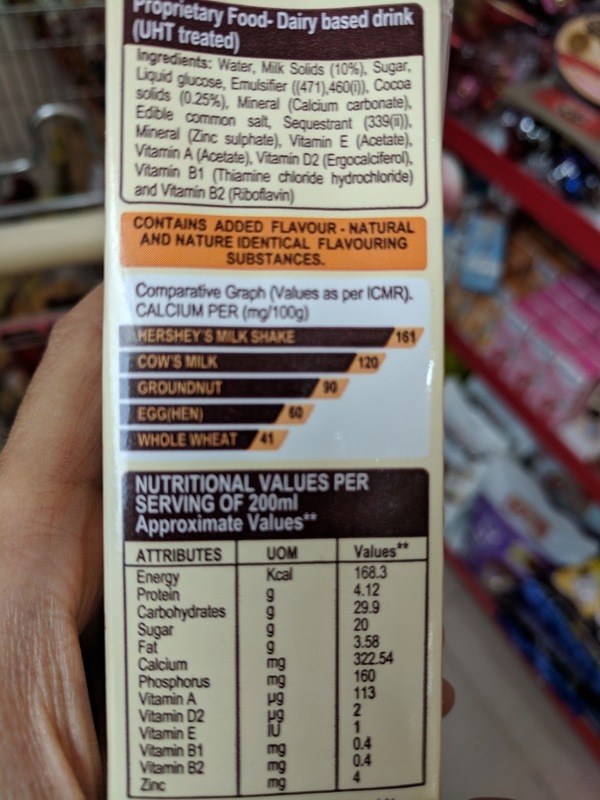 All four products mentioned above are extremely HIGH IN SUGAR. These are unnecessary and unhealthy junk foods that don’t deserve a place in our pantry or in our children’s diet. If your kid asks for any such products, take time, sit with them and explain to them that these are bad for their health and that these have harmful chemicals. For kids above 10 years, show them the list of ingredients when you take them out for shopping. It is high time all of us learn to understand and decipher the ingredients. Nice article, Very well written.